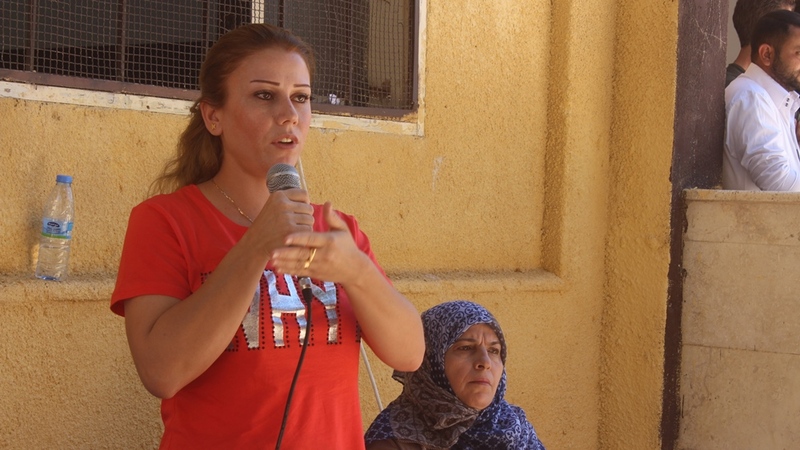 The meeting was held at the Women’s Council’s park, and was attended by Ahmed Suleyman, a co-chair of the Economic Committee in Tabqa, two administrators in the Women’s Committee, and many of Tabqa’s residents. At the beginning of the meeting, Nabila Muhamed, co-chair of the Union of Co-operative Societies in Jazira, talked about the idea of co-operatives, pointing out that co-ops depend on participation and the communal work of everyone, and that they improve the economic situation of every member. She also stressed the idea that women should be at the centre of these co-operatives, and they should be given the chance to become self-reliant to improve their own financial situation. At the end of the event there were discussions among the people, and the administrators listened to people’s enquiries and suggestions about co-operatives.